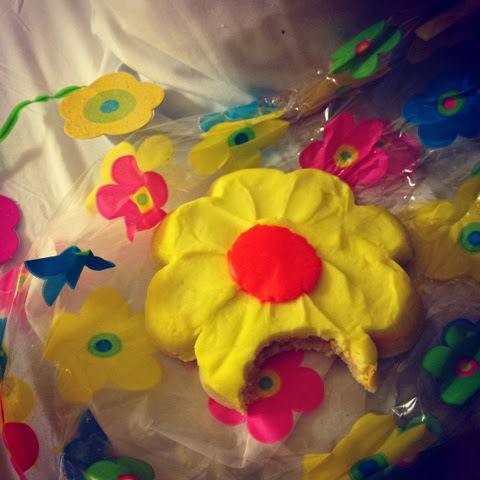 Yes I love cupcakes, but I also LOVE sugar cookies. But don't get confused, I don't like ALL sugar cookies. The frosting has to be just right. One of my newest friends, Jen (aka: Pink Cupcake Girl) brought my some sugar cookies from Cookie Connection in Roseville, CA. I blame her for getting me hooked! Perfect frosting, perfect cookie consistency. Sooooo delicious! And even better news, they sell online! I just found out for every dozen cookies they sell online, they donate $7 to Liberia (Orphan Relief Network). Love people who are making a difference. 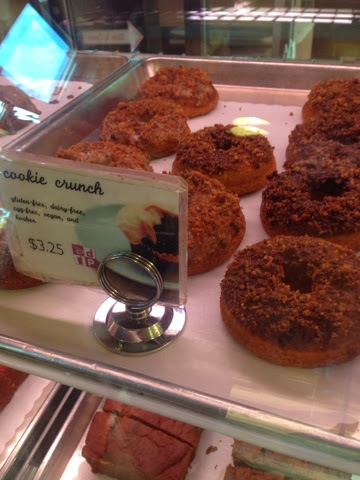 So if you're ever in the Roseville, Sacramento, or Woodland area, you MUST stop in to Cookie Connection! It seems like just yesterday my little boy was born. Wait, wasn't it yesterday?! 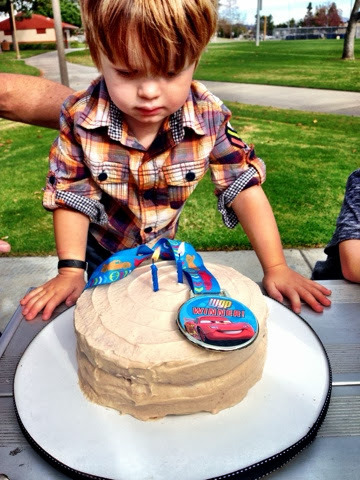 Before I could blink my eyes, he little boy turned two. Yes, two years old! He is such a joy and I love playing & talking cars, trucks, and tractors all day long! 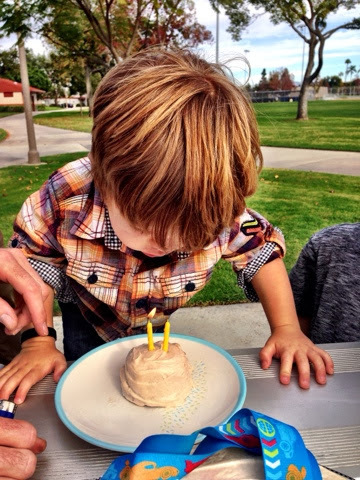 For his birthday I made him a snickerdoodle cake with a recipe from Love From the Oven. 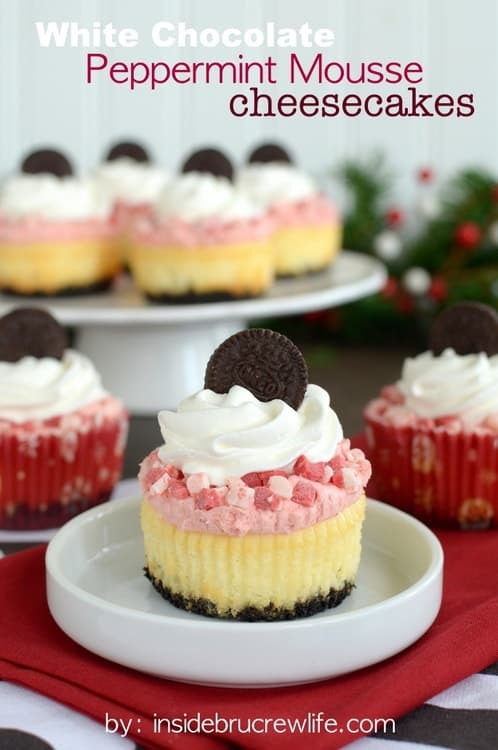 I had used this recipe for cupcakes before, so I knew it would be great. 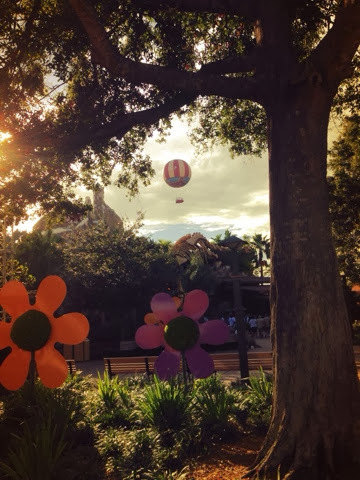 On my recent trip to Orlando, FL I found some time to visit Downtown Disney. I live near Downtown Disney in Anaheim, CA and assumed that the Florida would be the same. I have to admit that it's a lot better! It was so much bigger, had better restaurants, more stores, and a cupcake shop! 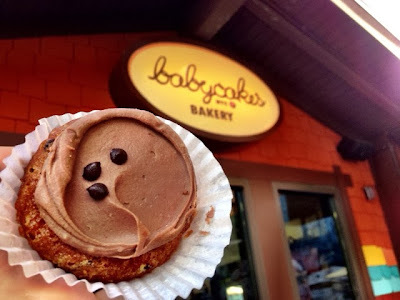 Yes, Downtown Disney in Florida has a Babycakes Bakery. Babycakes originated in New York City, but has branched out to LA and Orlando. Babycakes is different than most cupcake shop as their delicacies have no gluten, wheat, dairy, casein, and eggs. I tried to review Babycakes three years ago when my husband brought my some across the country. They didn't survive and I couldn't review them. 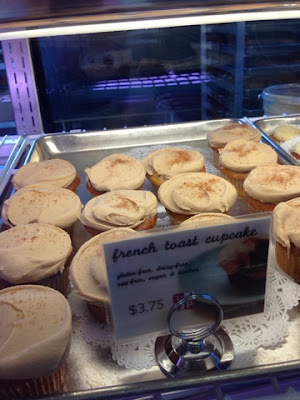 Now was my chance to try a fresh Babycakes cupcake! I actually picked up one cupcake top. Yes, it's just the top of a cupcake! And yes I only picked one item. I really wanted to try the donuts pictured above, but this was the perfect amount of cupcake I needed to satisfy my craving and do a quick review. I picked a Chocolate Blondie cupcake top and I wasn't impressed. 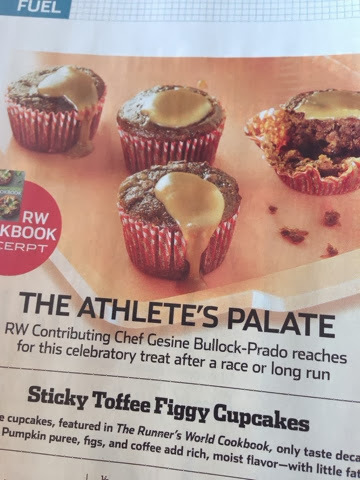 Maybe it's just because I am pro-dairy, gluten, wheat, and egg, but this cupcake just didn't do it for me. Maybe if I was vegan I might be satisfied with my pick, but this cupcake lacked the buttery frosting and sweet cake. 1674 E. Buena Vista Dr.
Dessert from a fast food restaurant? No thanks!...or so I thought. The other night my husband brought home dinner from El Pollo Loco, along with a small dessert. Meet the Mexican S'more! It compact and delicious and better than a regular s'more. Why? Because it's self-contained. 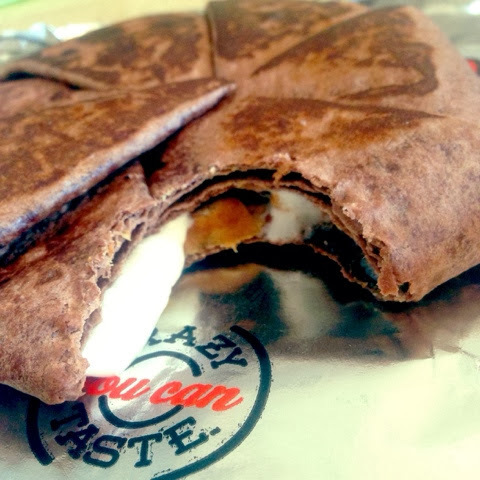 Talk a chocolate tortilla and fold in roasted marshmallows, graham cracker, and melted chocolate. Yummy!!! Don't trust me...you must try this for yourself. Someone recently told me they were thinking about becoming Paleo. But he said he didn't want to consider it if he couldn't have cupcakes. 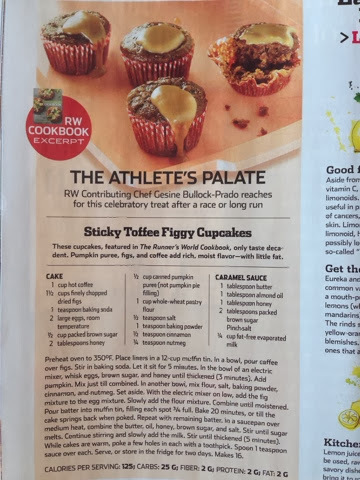 Luckily Runner's World recently published an article and recipe about paleo cupcakes. These Sticky Toffee Figgy Cupcakes are made with pumpkin puree, figs, and coffee. Talk about a weird mixture! I've heard Paleo can be a healthy diet, but if I couldn't eat bread I would never survive. I hope this recipe hopes some people survive the diet. 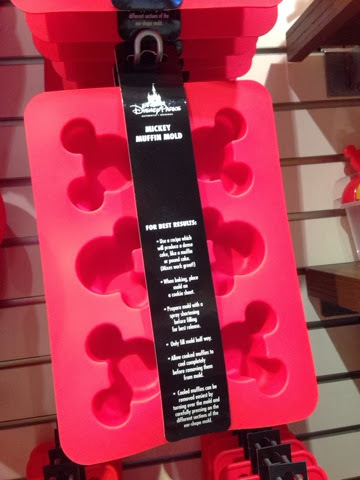 On my recent trip to Walt Disney World, a friend brought me cupcakes while I was working. So sweet! 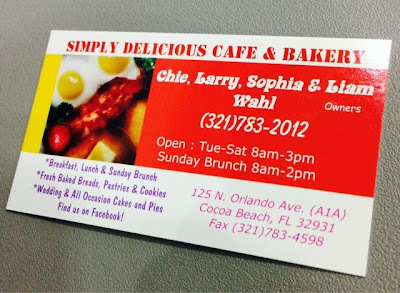 These cupcakes are from Simply Delicious Cafe & Bakery in Cocoa Bakery, FL. Never heard of them, but I'm not an expert on East Coast cupcakes (yet). 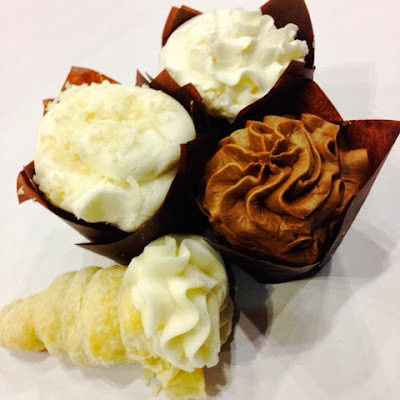 I received three flavors of cupcakes (vanilla, chocolate, and coconut), along with a frosting-topped croissant. These cupcakes almost looked too pretty to eat. That never stops me though. The frosting on these cupcakes were outstanding, definitely my favorite part. It was thick and buttery, but not too sweet. Usually I am turned off my plain vanilla cupcakes, but this one was different. The coconut cupcake was my favorite though. Nice subtle flavor on a moist cupcake. The one surprise was the frosting-topped croissant. Two great things put together...what could be wrong? I think croissants just aren't meant to have frosting. And that's ok. Gotta try or else how else would the world find out other great pairs such as chocolate & peanut butter and maple & bacon. My friend Angry Julie surprised me with an early birthday present and I have to admit that I'm in LOVE! 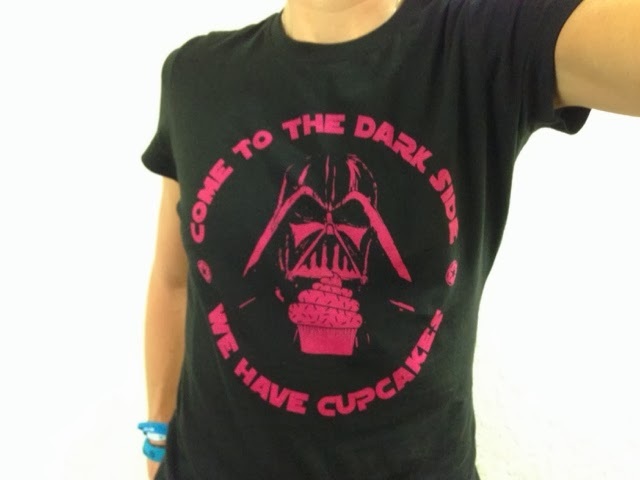 "Come to the dark side. We have cupcake." 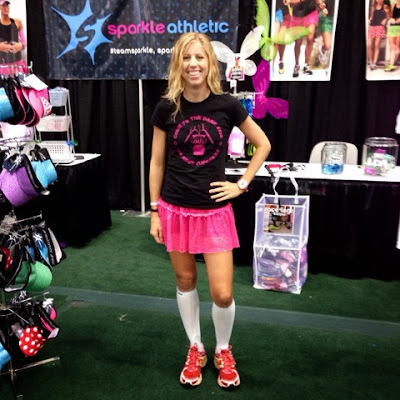 I love this shirt from Her Universe, but after looking at the website, there so many other shirts I love too! Julie gave me this shirt while I was at Walk Disney World a few weeks ago. It paired perfectly with my pink Sparkle Athletic skirt. Thanks Julie!